Warming up this morning at her overnight berth in the Pudzeoch at Renfrew, the small SPT ferry RENFREW ROSE is seen here as she prepares for her day's duty on the short crossing across the River Clyde from Renfrew to Yoker, on the opposite bank of the river. 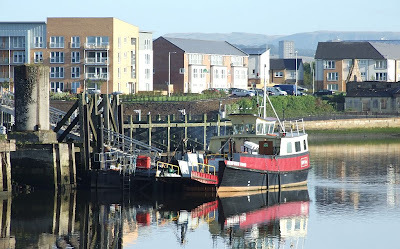 RENFREW ROSE, whose sister YOKER SWAN is completing her annual survey at the River Clyde Boatyard, was built at Ardrossan in 1984 and can carry up to 50 passengers. The two ferries are also capable of transporting an ambulance in an emergency.